I am a 37-year-old soon to be dad (maybe already a dad by the time this is posted) that lives with my wife, Natalie, and our dog, Ranger, in Gallatin. I am a Consultant Pharmacist for a Long-Term Care pharmacy located in Nashville. I recently started in triathlon after thinking about it for a couple of years. 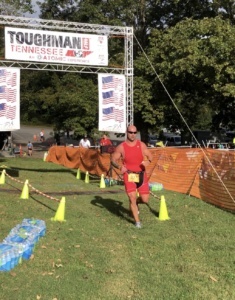 I ran the Music City Half Marathon 5 or 6 years ago and have always wanted to run another one but I find training only in running gets a little boring for me so adding in the bike and swim was very appealing. I also wanted to find a hobby that could improve my health and also be a little competitive. I have raced racecars and racing karts throughout most of my life so having something that is competitive is a big plus. I’m jumping in head first and training for the Chattanooga 70.3 in 2019 which I’m excited about for a few reasons. It will be a great challenge for me at my current skill level, the location will help provide a fun weekend, and there are quite a few people from HEAT and some others I know competing in it, many for their first 70.3. 1. How many years have you been in triathlon? 2. How many years have you been a part of HEAT? 3. How did you get started in triathlon? I was in Chattanooga a few years ago with my wife for a quick weekend trip and the Ironman race was in town. It was a great atmosphere and looked like it would be fun. I bought an entry level triathlon bike when looking for a road bike with the intentions of getting into the sport. A couple of years later (this year) I competed in the Cedars of Lebanon Tri for my first event. I competed in the Clydesdale class and finished second, 3 seconds behind first. 4. What is your favorite discipline? 5. What distances have you competed in? 6. What has been your favorite race? 7. What is your go-to nutritional product for training/racing? 8. What serves as your motivation to keep going when the training or the race seems too hard? The time spend away from my wife and family to train and not wanting to let them down. Also, the thought of those who aren’t able to train or compete due to disabilities. 9. What does your normal training week look like? It’s been getting more involved of more recent. Typically 2 swims, 3 bikes, and 2-3 runs. Around 6 hours a week now. 10. What is your first thought after finishing a triathlon?